DEUTERONOMY 31:6 KJV "Be strong and of a good courage, fear not, nor be afraid of them: for the LORD thy God, he [it is] that..."
3The LORD thy God, he will go over before thee, and he will destroy these nations from before thee, and thou shalt possess them: and Joshua, he shall go over before thee, as the LORD hath said. 4And the LORD shall do unto them as he did to Sihon and to Og, kings of the Amorites, and unto the land of them, whom he destroyed. 5And the LORD shall give them up before your face, that ye may do unto them according unto all the commandments which I have commanded you. 6Be strong and of a good courage, fear not, nor be afraid of them: for the LORD thy God, he it is that doth go with thee; he will not fail thee, nor forsake thee. 7And Moses called unto Joshua, and said unto him in the sight of all Israel, Be strong and of a good courage: for thou must go with this people unto the land which the LORD hath sworn unto their fathers to give them; and thou shalt cause them to inherit it. 8And the LORD, he it is that doth go before thee; he will be with thee, he will not fail thee, neither forsake thee: fear not, neither be dismayed. 9And Moses wrote this law, and delivered it unto the priests the sons of Levi, which bare the ark of the covenant of the LORD, and unto all the elders of Israel. Be strong, and of a good courage, feare not, nor be afraid of them: for the Lord thy God, he it is that doeth goe with thee, he will not faile thee, nor forsake thee. "Be strong and courageous, do not be afraid or tremble at them, for the LORD your God is the one who goes with you. He will not fail you or forsake you." 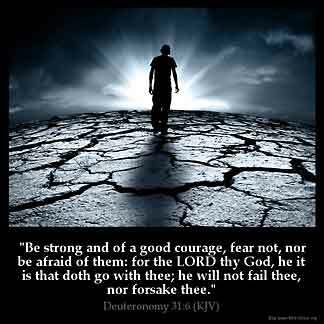 Be strong and of good courage, fear not, nor be affrighted at them: for Jehovah thy God, he it is that doth go with thee; he will not fail thee, nor forsake thee. Be strong and take heart, and have no fear of them: for it is the Lord your God who is going with you; he will not take away his help from you. Be strong and courageous, fear them not, neither be afraid of them; for Jehovah thy God, he it is that goeth with thee; he will not leave thee, nor forsake thee. Be strong and of a good courage, fear not, nor be afraid of them: for the LORD thy God, he it is that doth go with thee, he will not fail thee, nor forsake thee. Be strong and courageous, don't be afraid, nor be scared of them: for Yahweh your God, he it is who does go with you; he will not fail you, nor forsake you." Knowing that God is with me has brought me through very tough times. Thank you Lord for your love, this verse has helped me through challenges of life. The assurance through this Scripture that GOD is faithful,loving and will not forsake His people is an amazing blessing. Thank you LORD for allowing in your covenant multiple folds of people through Jesus our Savior. Bless the LORD oh my soul. This verse I will keep close to my heart, because its telling me to have confidence in every thing I do Jesus is with me always. This passage of the scripture is of a good powerful assurance to the children of God that, "with HIS MIGHTY HANDS HE 'd be our refuge. I thank God for His WORD.